Today took a bit of a twist. I left the house headed for work and immediately began to hear sounds from my clutch whenever I pushed the clutch pedal down. Soon it became hard to shift. Rather than get on the highway towards work, I headed straight to my mechanic. Leesa came and picked me up. My day was now a couple hours old and Leesa's as well. She had a lot of work to do, and had our dog Rev underfoot. I decided to take the day off and spring Rev and myself for a hike. It also took Rev out of Leesa's hands for the day so it was a win-win. I set my scope on 2 nearby peaks that I had never climbed: Squaw Mountain and Wyman Hill (not nearby Wyman Mountain in the Dix Wilderness). These two peaks lie in the Hoffman Notch Wilderness in North Hudson. 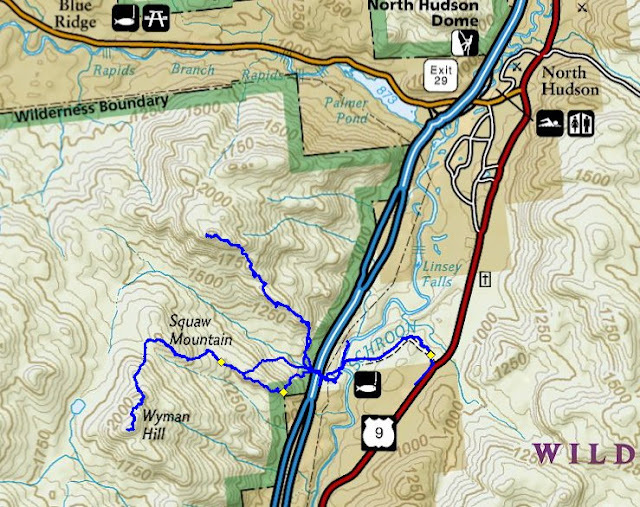 I decided to access them the same way I had attacked the un-named "Palmer Pond Mountain" that I had climbed twice previously; namely to take the woods road on the North Hudson trail system to the Schroon River, ford the river, cross under the North I-87 using the Wyman Hill culvert, then bushwhack. The North Hudson fish weir on the Hudson River. At the Schroon River I detoured north a couple minutes to revisit the remains of the old fish weir. At the weir it was obvious how low the current water level is in the river. I crossed the river a little ways south of the weir where it was only ankle deep. I had brought my water shoes with me and I left them of the far side of the river for the return trip. Once across the river I nosed around to find the walking culvert. It's not easy to spot and even though I had been through it several times before, it took me a few minutes. On the west side of the interstate, I made my way southwest. 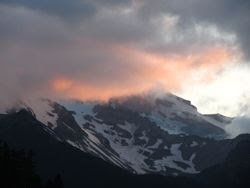 I wanted to pick up the beginning of the long ridge on the eastern flank of the mountain. This approach ridge turned out to be the best part of the entire hike. After an initial steep climb, negotiating some rock faces, I ascended a very scenic ridge, staying on the south edge of the ridge. This scenic ridge lasted for 0.7 miles before it reaches the actual summit cone of Squaw Peak. The next 12 pictures below are from this ridge. A sampling pictures from the eastern approach ridge to Squaw Mountain. Looking south from the approach ridge. Pharaoh Mountain in the back left; I-87 in the back center. While climbing the Squaw Mountain summit cone eastern face, I was in a hardwood forest with no views. Perhaps when the leaves are down this changes. I stopped for a minute on Squaw then dropped a 100 feet into a small col before climbing 500 feet to Wyman Hill. The summit of Wyman is open rock, but it is enclosed by tall pines so the view is minimal. Looking around a bit I was able to find a filtered view of Paradox Lake. The sky was getting dark with the threat of rain by the time I reached Wyman. I told Rev it was time to go back and she put her nose to the ground and led us back the way we had come. When we got up on the approach ridge to Squaw Mountain it started to rain so I decided to drop off the ridge heading northwest. When we reached a drainage, I knew to follow it southeasterly back to the drainage culvert and adjacent walking culvert. I the river I put my water shoes back on for the crossing and then we took the North Hudson woods road trail back to the car. The route on the Nat Geo Map. 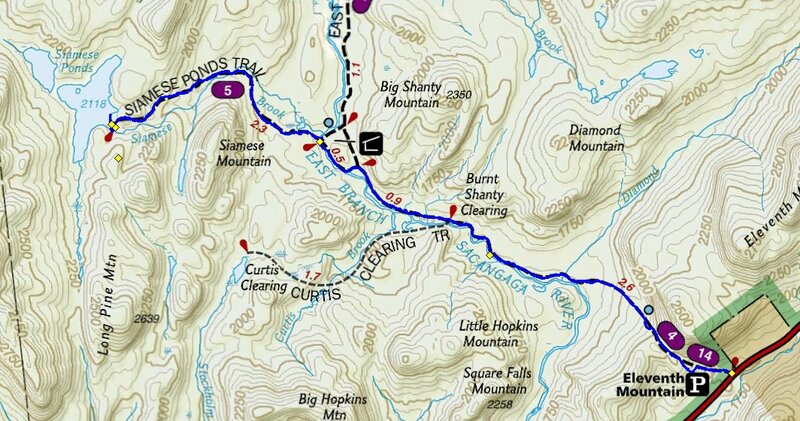 The northern line was from the trip to "Palmer Pond Mountain". When I asked my wife Leesa what kind of a hike she wanted for Labor Day, she said wanted a trail hike (no bushwhack), kind of long, somewhat flat, with water along the way and not a lot of people. 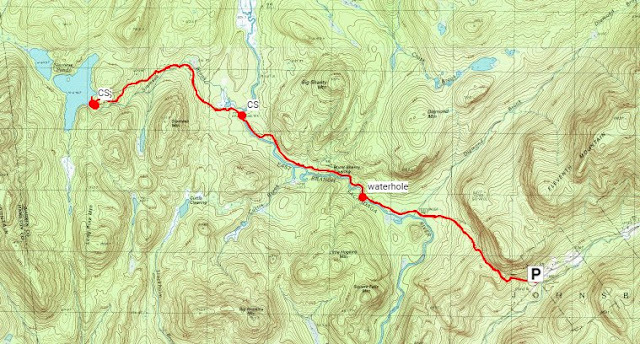 The hike that came to my mind was Siamese Ponds from the Eleventh Mountain parking area on Route 8. While I often xc ski to the Sacandaga leanto at the suspension bridge, I hadn't been to Siamese Ponds since 1983! We got a late 10:30 start, but knew we had plenty of time to do this hike. I've only done this route in fall and winter, so it looked a bit different today. It was another beautiful day today; as it has been all week. I can't remember a Labor Day weekend with weather this good. Looking towards the southern shoulder of 11th mountain from the trail. The trail starts with a quick climb to a pass just south of 11th mountain. Once through the pass is a nice mocerate descent (great on skis) to a footbridge at Diamond Brook. About a half mile past the footbridge is a nice waterhole on the river and we stopped for a bit. Leesa took off her shoes and soaked her feet. East Branch Sacandaga River (with a low water level)! Leesa... getting ready to soak her feet. Continuing on, we passed a man who had been backpacking for a couple days and he was on his way out. After a total of 4 pleasant miles, we arrived at the Sacandaga leanto. I was really surprised that no one was there, since we had seen 5 cars in the parking lot when we arrived. Orange and yellow leaves on this tree. This must be a practive log for this beaver. We sat down in the leanto and started to pull out lunch. Almost immediately two guys with a dog came across the bridge from the Siamese Ponds direction. Unfortunately their dog and Rev played for a minute but then got into a tussle. We had to seperate the dogs and they went on their way. With it quiet once again, we ate our lunch at this beautiful spot. I'm still amazed that a suspension bridge was built here. I know one was needed to cross the East Branch Sacandaga River, but the hiker traffic through here is rather light, even on holiday weekends with perfect weather. In any case, I'm glad the bridge is there. We used it after lunch. Leesa and Rev aren't super comfortable with suspension bridge, especially long ones like this, but it isn't very high over the river and they did it. The view of the river from the bridge. From the leanto it is another 2.3 miles to Siamese Ponds. This is the portion of the trail that I had not been on since 1983. I had no recollection of it. I thought it would be somewhat overgrown, but I was wrong. It was in pretty good shape except for a couple recent fallen trees. After an hour of hiking we reached the pond and it was quite beautiful. There was a sandy area at the trail terminus and the pond bottom was sandy as well. Leesa went for a swim and I walked north a little ways on the eastern shore. A large nice campsite just before the trail reaches the pond. There is actually a pair of ponds, and I've never seen the more westerly upper pond. There is supposedly a nice campsite on the small piece of land between the two ponds, but we didn't have time today to bushwhack around the lower pond to check it out. Sometime I'll have to go back in to see it, or we'll have to camp and do some more exploration. Not a bad idea. The only trail back was the way we had come. Not horrible, and it was such a nice day. We stopped again at the same waterhole we used on the way in to stop again and stick our feet in the water. A very peaceful day and a nice hike. Leesa said that my choice of hikes was just what she had wanted for the day. We got back to the car around 4:45 PM.